Up until a few years ago this site was an active military installation and access was strictly forbidden. It was even pixelated on Google Maps. This collection of mostly mid-20th century buildings was the Air Force Command HQ. It was closed a few years ago but the government opened it to the public in 2014 and agreed to preserve it. Current plans include using it for start-ups and as an arts center. Slowly buildings are being restored and re-used. It is an enormous site, and some buildings are big and in a bad way. For my latest project I was hired to create a map of the site for visitors. In doing so I was able to get inside a few buildings which are currently off-limits to the public. The site was first occupied in the Japanese era when this part of the city was a low density residential neighborhood. As you can see from the images below not a lot of the complex from that time still remains. It seems it was extensively modernized in the 1960's and 70's. Only the red brick part of the main building, a small maintenance garage, and a low white building with an orange roof remain from the 1940's. The rest of the structures are fairly ordinary mid 20th century dormitory and office buildings. There aren’t many photos of the site during its air force days, probably because it was a restricted area. The air force command moved to a new base in Dazhi a few years ago, which sort of looks like a sci-fi prison. This left a lot of question marks around the Renai site, not all of which are answered. The former main entrance guard towers. This way is closed at the moment. Currently the entrance is on Jianguo Rd and it's open to the public. A few of the buildings here have been turned into offices. One is currently being used by a VR firm. The first thing that struck me on entering is how spacious the grounds are, and how much concrete there is. I expect these large areas were used as parade grounds and to store vehicles. The bay windows on the Japanese era main building on the right. 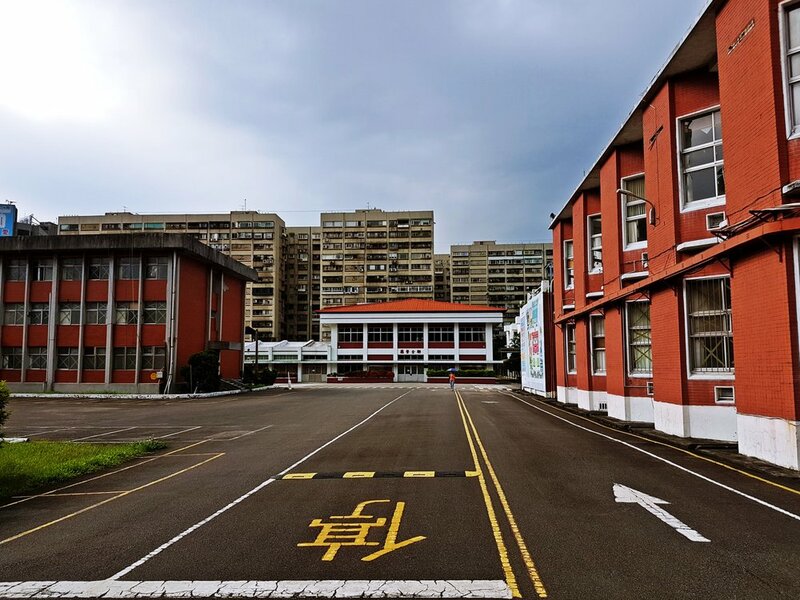 Going forward, the main building is on the right, and some modernist dormitories are on the left. One building here houses the Red Room community space and a workshop for sculptors. These are both great uses of the building and I hope more like this can be found for the other buildings. Behind Red Room there are three small dormitories, but they are empty and not very interesting. The awful four-floor yellow and brown building is a school and not part of the base. The small entrance block with the Japanese era building behind it. The main building is split into three parts, each part built in a different year. The oldest part is the deep red institutional building with the sloped roof. A small entrance block was added facing Renai Road sometime in the 1960’s. At the rear a long building from either the 60’s or 70’s closes off an overgrown inner courtyard. One thing I was a bit disappointed by is that the buildings have been mostly emptied out. I was hoping to see some kitschy old propaganda posters or retro spying equipment. The deep red section is a huge structure with double height ceilings and corridors wide enough to drive a car through. Due in part to its bay windows it was designated a city heritage site. I’ve only seen this window style on one other colonial building in the city – the huge gray extension of the old Taida Hospital which I think dates from the same time. Together they were some of the last Japanese era government buildings. Inside one of the bays. For some idea of the ceiling height there was plenty of room to walk beneath these lights. The main buildings have suffered a lot from water damage and there were puddles in a few places. This section is going to be a huge repair job and no-one’s really sure what it could be re-used as. I also have a feeling that with such high ceilings it’ll be very cold in winter. There are a couple of strange rooms on the second floor which seem to have viewing galleries around them. Perhaps they were once courtrooms. There is a small third floor in the roof but it's dark and the floors are quite unstable. One of the rooms with the strange balconies. The more modern front block is joined to the larger building by this keyhole portal. The generals’ offices were located in this extension, and they still have a couple of huge maps in them. The main stairway looks a lot like one in my university dorms. This block has a secret section that is accessed through another door around its side. There’s a map showing the locations of all Taiwan’s military aircraft in there. I decided against posting it, just in case it’s still accurate. To the left of this extension is a bunker covered in vegetation. Apparently it’s an old weapons store. The third section, the long rear building, is in a really bad condition. Some of the roof rails have crumbled and a basement level has completely flooded. This section is very narrow with low ceilings, and it seems a lot mustier than the other sections. The central courtyard is very overgrown and is just a plain open space. The flooded basement and a typical classroom in the rear section. Just off to the left of the main building is the blocky gray Zhongzheng Hall. This is a large auditorium that seems to be used fairly often for events. The interior is quite well preserved. The eastern side of the site is dominated by a large sports hall, covered in corrugated metal. A couple of nearby buildings are being used as a ‘start-up incubator’. Sometimes the vocabulary used regarding start-ups is baffling to me. There’s a small garage building which doesn’t look like much from the outside but it has a historic wooden roof structure. It is one of the oldest parts of the site. I’m still quite surprised the entire site was preserved. It’s sitting on some of the most expensive land in the city and I’m sure developers were dying to build luxury complexes on it. The Palace, one of the most expensive developments in the city, is next door along with a few other high-end towers. Apart from the main building a lot of the structures on the site are neither historical nor interesting. 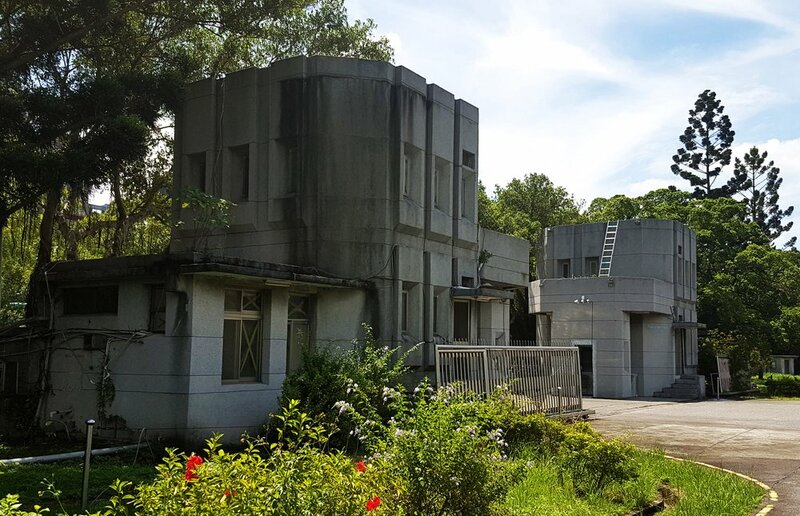 There are quite a few other derelict historical sites in the city, some of which were unnecessarily destroyed in the last few years (e.g The Nangang Bottle Cap Factory). The city is also desperately in need of more public housing and I saw it mentioned that this was a proposed site for more. Dangnammit kids I'm tryin' to launch a jet here! I have my own theory (conspiracy perhaps) as to why preservation was successful here. As I mentioned, the buildings around it are some of the most expensive in Taiwan. A lot are owned by influential politicians and business-people. 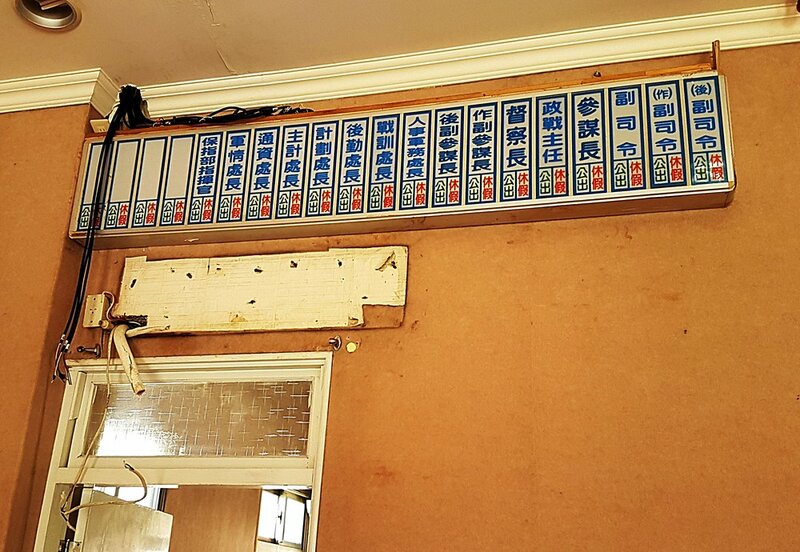 Time and time again I’ve seen prejudice against public housing shown in Taiwan’s press by wealthy homeowners. They worry that construction of public housing nearby will lower the value of their own homes. It’s ridiculous and mean-spirited, and it perpetuates a cycle where the wealthy push public housing developments and lower income residents further out of the city. I wouldn’t be surprised if the influential people around the HQ nixed any public housing plans for these reasons. Even if it were to be luxury housing, years of demolition and construction would have inconvenienced the people living around it, and perhaps this was another reason. A pillbox with the Palace complex behind it. In any case, I'm still glad the site is being saved. At least it is being used to benefit the community and not turned into department stores. I personally would have demolished the three northern small dormitories and built some much needed public housing there. I don’t think the integrity of the site would have been compromised by that as it is enormous. An old housing block adjacent to the site that looks abandoned but it's actually inhabited. At the end of this year management of the site will be turned over to the Ministry of Culture. I’m unsure what that means for its future. As I mentioned the site is in need of a lot of repairs and no-one’s found a use for several large buildings yet. I suggested housing homeless people in the empty dormitories and training them to undertake repair jobs in the other buildings. In return they learn skills, a wage, and can stay on as staff at the base or join a construction firm afterwards. As the people who will take over the site aren't yet known there's now way of going forward on something like that yet. I’ll update this post as things move forward. At the moment most of the site feels very empty and I hope some life can be breathed back into it.